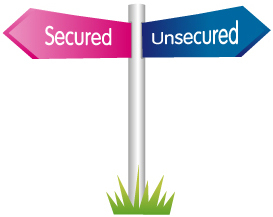 If you are looking to raise funds, you could be forgiven for being confused about which route to go down to find the right loan for your requirements - so what is the difference between secured and unsecured loans? If you are a homeowner, a secured loan could allow you to borrow money at a low rate against your property, even if you have a poor credit history. One key difference between secured and unsecured loans is that with a secured loan, the amount available to borrow is from £5,000 to £2,500,000. Secured Loan Representative Example: If you borrow £31,000 over 14 years at a rate of 12.758% variable, you will pay 168 instalments of £447.83 per month and a total amount payable of £75,235.44. This includes the net loan, interest of £40,240.44, a broker fee of £3100.00 and a lender fee of £595.00. The overall cost for comparison is 16.4% APRC variable. Now you’ve seen the difference between secured and unsecured loans, hopefully this will allow you to make a more informed decision on what is right for you. See if you qualify for a secured loan from £5,000 to £2,500,000 before you apply, simply by answering a few questions below. It will provide you with immediate loan options available for you to apply for based on the details you provided.